Booth #236417 - ATI will present three new products at the 2018 show. You may have heard about the Axia80; ATIs high-performance, low-cost force/torque sensor, but this year attendees can see it live in an interactive demonstration. 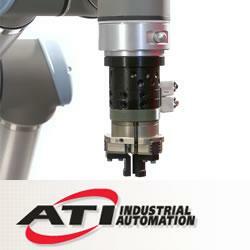 ATI Industrial Automation will exhibit at this year’s IMTS show in Chicago, IL. ATI is a world-leading developer of engineered products that enhance the flexibility of robotic and automated processes. Their products appear in a variety of industries and applications all over the world; the common theme among these applications is increased productivity. Speaking of new solutions, ATI will present three new products at the 2018 show. You may have heard about the Axia80; ATI’s high-performance, low-cost force/torque sensor, but this year attendees can see it live in an interactive demonstration. The Axia80 integrates easily with collaborative robots and is mounted to a Universal Robot to simulate a part finishing application. The addition of an F/T sensor from ATI increases the dexterity of robotic processes. It provides continuous feedback and gives users a high level of process control. In this demonstration, viewers manipulate a metal workpiece as the Axia80 ensures constant pressure on the part. Another innovative product on display is ATI’s new MC-10 manual tool changer. This compact yet robust tool changer suits any application where the user needs to change tools by hand. It features an ergonomic, twist-collar locking mechanism that provides a tactile “click” between the lock and unlocked positions. The MC-10 is designed with integrated air ports and fail-safe features that resist vibration and prevent loosening. It accommodates an add-on electrical module if additional utilities are needed. ATI’s Universal Compliance Compensator debuted late last year but will make its first live show appearance at IMTS 2018. The UCC compensates for misalignment between the tool and the workpiece. In this year’s IMTS demonstration, FANUC robots equipped with ATI’s tool changers, deburring tools, and the UCC streamline positioning inaccuracies in processes such as bin-picking, mechanical assembly, and robotic finishing. The IMTS show brings many industry players together to share ideas and solutions. For ATI, this show provides a chance to learn about the latest manufacturing trends as well as common challenges. The company brings many engineering, sales, and application staff to the show; not only manning their exhibit booth but also participating in the educational sessions and walking the show floor. It’s not all work, however. The greater Chicago area boasts a wide variety of restaurants, shops, and entertaining activities; there is indeed something for everyone. IMTS 2018 will be a fantastic event where attendees can gain inspiration and spark their creativity. ATI looks forward to taking part in this year’s IMTS show in Chicago — as both exhibitor and attendee. Be sure to stop by ATI’s booth 234617 during your visit. ATI Industrial Automation's MC-10 Manual Tool Changer provides a cost-effective solution for quickly changing tools by hand. Its compact yet robust design is optimized for collaborative robot applications. The ergonomic twist-collar locking mechanism ensures a secure attachment of the tool and easy manual operation with tactile feedback. 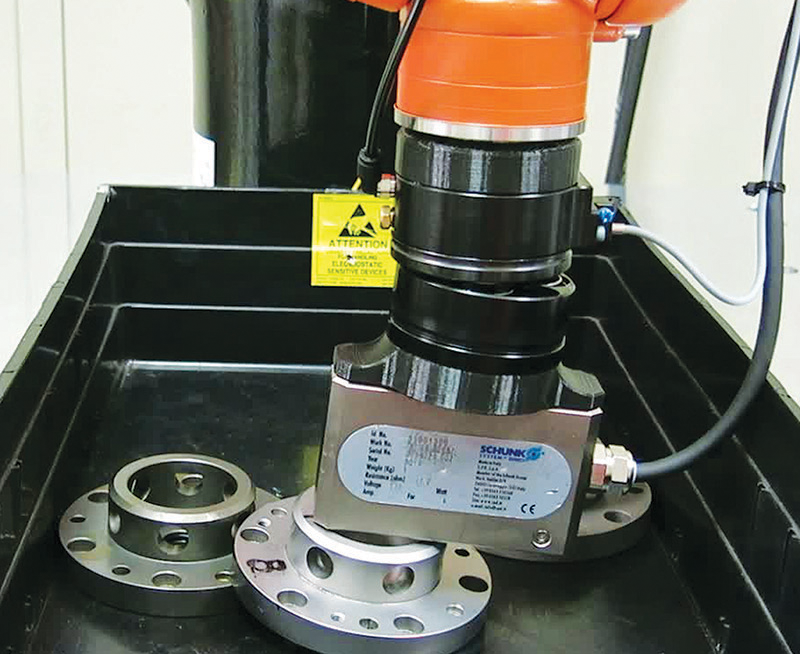 This Manual Tool Changer can carry payloads of up to 22 lbs and includes multiple fail-safe features that resist vibration and prevent loosening. The MC-10 Manual Tool Changer has integrated air pass-through connections and options to connect electrical utilities if needed. ATI will feature the new MC-10 along with a variety of other robotic demonstrations and product displays at this year's IMTS show in Chicago (Booth #236417).